What does that look like to you? The cave drawings at Lascaux, maybe? How about this one? A shield from an ancient civilization? Nope, these are the lowest of the world’s low-value coins, those forgotten bits of metal that keep lint company in our pockets or fill forgotten jars. 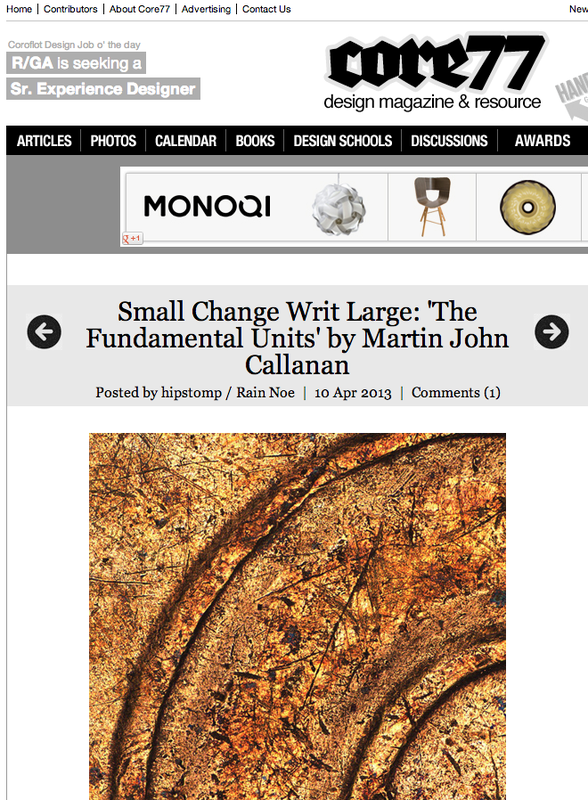 Perhaps sensing that cents are on the way out, Martin John Callanan—self-described as “an artist researching an individual’s place within systems”—is photographically preserving them for posterity with his The Fundamental Units project. The kicker is that a regular camera wouldn’t do, not for what Callanan had in mind; so he teamed up with the UK’s National Physical Laboratory, which is that country’s national measurement standards lab, to use their infinite focus 3D optical microscope. Callanan then captured some 4,000 exposures of each freaking coin, resulting in a series of 400 megapixel images that, blown up and hanging on a gallery wall, reveal details you’d never spot on the real deal. Every nick, scratch, dent, ding and discoloration are laid bare.